The TradignView.com GUNBOT addon is OUT ! 4. 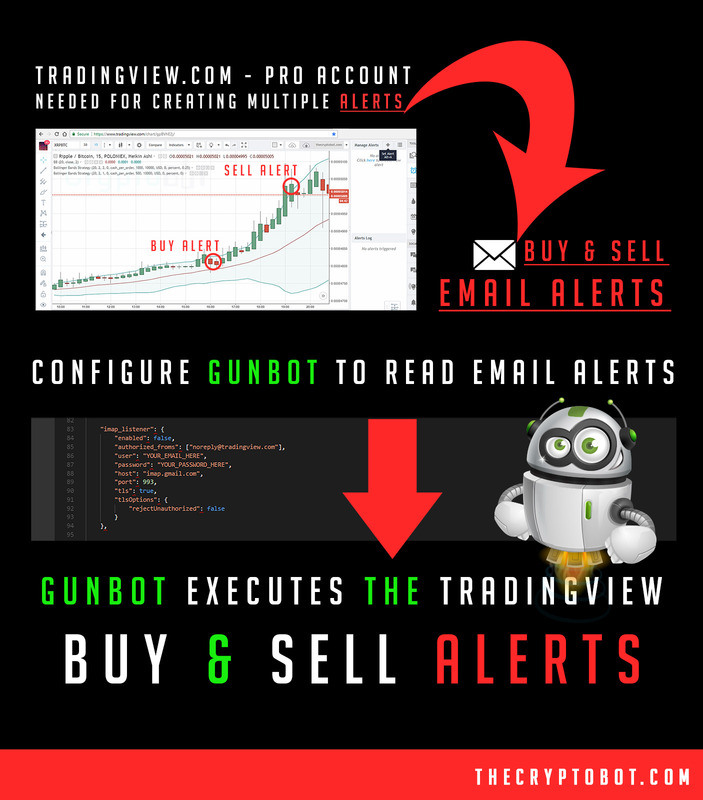 Gunbot executes the BUYs and SELLs from the TradingView.com Alerts. 1. Open a TradingView chart for your coin-pair & market . 3. To set an Alert, in your Chart, top right you will see the Alerts Icon – click on that and a pop-up will appear . 4. We will set a BUY Alert when the SMA5 and SMA10 lines cross in a Up Trend . Set the frequency at once per Candle Stick. The minimum requirements to run this addon are : a Gunbot 5 version or above and a paid TradingView account . All the configuration settings, the Email Imap Listener settings and the TradingView settings can be set in config.js from your Gunbot 5 folder . “TV_TRADING_LIMIT_SELL”: 0.001, // the trading limit for the TradingView generated sell. limit to sell is expressed in quote currency not in BTC . Happy Trading and Plus Profits !